Since the navy's May 31 takeover of the Turkish-Hamas flotilla , Prime Minister Binyamin Netanyahu and his advisors have deliberated around the clock about how to contend with the US-led international stampede against Israel. But their ultimate decision to form an investigatory committee led by a retired Supreme Court justice and overseen by foreign observers indicates that they failed to recognize the nature of the international campaign facing Israel today. Led by US President Barack Obama, the West has cast its lot with Hamas against Israel. 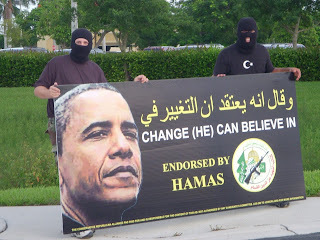 It is not surprising that Obama is siding with Hamas. His close associates are leading members of the pro-Hamas Free Gaza outfit. Obama's friends, former Weatherman Underground terrorists Bernadine Dohrn and William Ayres participated in a Free Gaza trip to Egypt in January. Their aim was to force the Egyptians to allow them into Gaza with 1,300 fellow Hamas supporters. Their mission was led by Code Pink leader and Obama fundraiser Jodie Evans. Another leading member of Free Gaza is former US senator from South Dakota James Abourezk. All of these people have open lines of communication not only to the Obama White House, but to Obama himself. Obama has made his sympathy for the Muslim Brotherhood clear several times since entering office. The Muslim Brotherhood's progeny include Hamas, al Qaida and the Egyptian Islamic Jihad, among others. Last June, Obama infuriated the Egyptian government when he insisted on inviting leaders of the Muslim Brotherhood to attend his speech at Al Azhar University in Cairo. His administration's decision to deport Hamas deserter and Israeli counter-terror operative Mosab Hassan Yousef to the Palestinian Authority where he will be killed is the latest sign of their support for radical Islam. Given Obama's attitude towards jihadists and the radical leftists who support them his decision to support Hamas against Israel makes sense. What is alarming however is how leaders of the free world are now all siding with Hamas. That support has become ever more apparent since the Mossad's alleged killing of Hamas terror master Mahmoud al Mabhouh at his hotel in Dubai in January. In the aftermath of Mabhouh's death, both Britain and Australia joined the Dubai-initiated bandwagon in striking out against Israel. Israel considers both countries allies, or at least friendly and has close intelligence ties with both. Yet despite their close ties with Israel, Australia and Britain expelled Israeli diplomats who supposedly had either a hand in the alleged operation or who work for the Mossad. It should be noted that neither country takes steps against outspoken terror supporters who call for Israel to be destroyed and call for the murder of individual Israelis. For instance, in an interview last month with the Australian, Ali Kazak, the former PLO ambassador to Australia effectively solicited the murder of the Jerusalem Post's Palestinian affairs correspondent Khaled Abu Toameh. Kazak told the newspaper, "Khaled Abu Toameh is a traitor." Allowing that many Palestinians have been murdered for such accusations, Kazak excused those extrajudicial murders saying, "Traitors were also murdered by the French Resistance, in Europe; this happens everywhere." Not only did Australia not expel Kazak or open a criminal investigation against him. As a consequence of his smear campaign against Abu Toameh, several Australians cancelled their scheduled meetings with him. And of course, this week we have the actions of Germany and Poland. Germany and Poland are considered Israel's best friends in Europe today, and yet acting on a German arrest warrant, Poland has arrested a suspected Mossad officer named Uri Brodsky for his alleged involvement in the alleged Mossad operation against master Hamas terrorist Mabhouh. Israel is now caught in a diplomatic disaster zone where its two closest allies - who again are only too happy to receive regular intelligence updates from the Mossad - are siding with Hamas against it. And then of course we have the EU's call for Israel to cancel its lawful blockade of the Gaza coast. That is, the official position of the EU is that Israel should allow an Iranian proxy terrorist organization to gain control over a Mediterranean port and through it, provide Iran with yet another venue from which it can launch attacks against Europe. For their part, the Sunni Arabs are forced to go along with this. The Egyptian regime considers the fact that the Muslim Brotherhood took over Gaza a threat to its very survival and has been assiduously sealing its border with Gaza for some time. And yet, unable to be more anti-Hamas than the US, Australia and Europe, Mubarak is opening the border. Arab League Secretary General Amr Mussa's unprecedented visit to Gaza this week should be seen as a last ditch attempt by Egypt to convince Hamas to unify its ranks with Fatah. Predictably, the ascendant Hamas refused his entreaties. As for Fatah, it is hard not to feel sorry for Fatah leader Mahmoud Abbas these days. In what was supposed to be a triumphant visit to the White House, Abbas was forced to smile last week as Obama announced the US will provide $450 million in aid to his sworn enemies who three years ago ran him and his Fatah henchmen out of Gaza. So too, Abbas is forced to cheer as Obama pressures Israel to give Hamas an outlet to the sea. Such a sea outlet will render it impossible for Fatah to ever unseat Hamas either by force or at the ballot box. Hamas's international clout demonstrates to the Palestinians that jihad pays. There are three plausible explanations for the West's decision to back Hamas. All of them say something deeply disturbing about the state of the world today. The first plausible explanation is that the Americans and the rest of the West are simply naïve. They believe that by backing Hamas against Israel, they are advancing the cause of Middle East peace. If this is in fact what the likes of Obama and his European and Australian counterparts think, then apparently, no one in the West is thinking very hard these days. The fact is that by backing Hamas against Israel, they are backing Hamas against Fatah and they are backing Iran, Syria, Turkey, Hamas and Hizbullah against Egypt, Jordan, and Saudi Arabia as well as against Israel. They are backing the most radical actors in the region - and arguably in the world - against states and regimes they have a shared strategic interest in strengthening. There is absolutely no way this behavior advances the cause of peace. The second plausible explanation is that the West's support for Hamas against Israel is motivated by hatred of Israel. As Helen Thomas's recent remarks demonstrated, there is certainly a lot of that going around. The final plausible explanation for the West's support for Hamas against Israel is that the leaders of the West have been led to believe that by acting as they are, they will buy themselves immunity from attack by Hamas and its fellow Iranian axis members. As former Italian President Francesco Cossiga first exposed in a letter to Corriere della Serra in August 2008, in the early 1970s then Italian prime minister Aldo Moro signed a deal with Yassir Arafat that gave the PLO and its affiliated organizations the freedom to operate terror bases in Italy. In exchange the Palestinians agreed to limit their attacks to Jewish and Israeli targets. Italy maintained its allegiance to the deal - and the PLO against Israel - even when Italian targets were hit. Cossiga told the newspaper that the August 1980 bombings at the Bologna train station - which Italy blamed on Italian fascists - was actually the work of George Habash's Popular Front for the Liberation of Palestine. Eighty-five people were murdered in the attack, and still Italy maintained its agreement with the PLO to the point where it prosecuted and imprisoned the wrong people for the worst terrorist attack in Italian history. Cossiga alleged that the deal is still in place today and that Italian forces in UNIFIL have expanded the deal to include Hamas's fellow Iranian proxy Hizbullah. It isn't much of a stretch to consider the possibility that Italy and the rest of the Western powers have made a similar deal with Hamas. And it is no stretch at all to believe that they will benefit from it as greatly as the Italian railroad passengers in Bologna did on August 2, 1980. True, no one has come out an admitted that they support Hamas against Israel. So too, no one has expressed anything by love for Israel and the Jewish people. But the actions of the governments of the West tell a different tale. Without one or more of the explanations above, it is hard to understand their current policies. Since the flotilla incident, Netanyahu and his ministers have held marathon deliberations on how to respond to US pressure to accept an international inquisition of the IDF's lawful enforcement of Israel's legal blockade of the Gaza coast. Their deliberations went on at the same time as Netanyahu and his envoys attempted to convince Obama to stop his mad rush to give Hamas an outlet to the sea and deny Israel even the most passive right of self defense. It remains to be seen if their decision to form an investigative panel with international "observers" was a wise move or yet another ill-advised concession to an unappeasable administration. What is certain however is that it will not end the West's budding romance with Hamas. The West's decision to side with Hamas against Israel is devastating. But whatever the reasons for it, it is a fact of life. It is Netanyahu's duty to swallow this bitter pill and devise a strategy to protect Israel from their madness.